Luxury New York architect Peter Marino is allegedly being sued for making racist and sexist comments. Deirdre O’Brien, Marino’s former office manager, worked at his eponymous firm for 14 years. On October 26, Marino allegedly “’unleashed a tirade’ against her in front of male executives… He ordered her out, calling her a ‘c–t’ as her back was turned” reported the Post's Page 6. The suit also alleges that this is not an isolated incident, but rather the tipping point for O’Brien, who claims that Marino has a history of making racist comments against his black and Asian employees, as well as calling his female employees offensive names. O’Brien claims that she was fired after issuing a complaint to the HR department, which is what led to her unfair dismissal suit. Marino, known as “fashion’s favorite architect,” has designed hundreds of stores for high-end fashion brands such as Chanel, Christian Dior, Bulgari, and Louis Vuitton, and got his break designing Andy Warhol’s townhouse in 1978. Recently, he designed a 12-story residential building on New York’s Highline with developer Michael Shvo. He is also rather infamously known for his biker-inspired, full-leather get-ups—replete with codpieces. Unfortunately for Marino, not everyone has leather-thick skin when it comes to being called the c-word. The artist whose name is linked inextricably to screen prints of Marilyn Monroe and the Campbell’s soup can also had a fruitful career in feature films, producing Andy Warhol’s Frankenstein and Chelsea Girls. As part of the Midnight Moments series, Times Square will run screen tests by Andy Warhol on its billboards to replace its million-dollar neon advertising—for a fleeting three minutes a day, anyway. The footage of Warhol’s piercingly personal screen tests with friends and celebrity guests will appear each night from 11:57p.m.–12:00a.m. Lapses in ad revenue should be marginal, if negligible. Some of this footage has rarely, if ever, been shown outside of a museum setting. Candid shots of screen and music legends Lou Reed, Bob Dylan, Allen Ginsberg, Edie Sedgwick, and Dennis Hopper filmed from 1964 to 1966 will be blown up to epic proportions on the world’s most iconic billboards in Midtown Manhattan from May 1 through 31. The Midnight Moments series is aimed at bringing more art-oriented work into the otherwise corporate vacuum, where deep-pocketed multinationals shell out $3.8 million to advertise for 30 seconds during the Superbowl in one of New York’s most tourist-thronged, well-connected hubs. 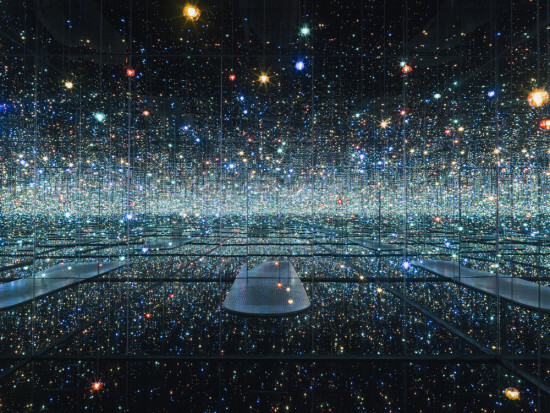 Previous initiatives include a video installation by Yoko Ono titled Imagine Peace and a multi-screen showing of Bjork’s music video for Mutual Core. 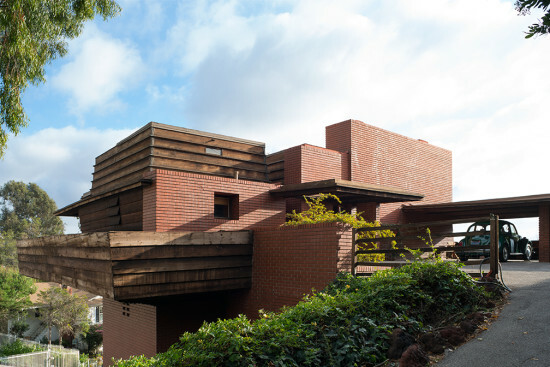 In yet another round of preservationist vs. developer, it appears developer has won again. This time, the fight took place at 67 Vestry Street in Tribeca—the site of an 11-story palazzo building that came to life as a warehouse for the Great Atlantic and Pacific Tea Company in 1897. BuzzBuzzHome reported that the Department of Buildings has approved plans by prolific developer and art collector Aby Rosen for an 11-story luxury condo building at the site. As AN reported last spring, the building's tenants tried to stop those plans by launching a petition to landmark the structure. 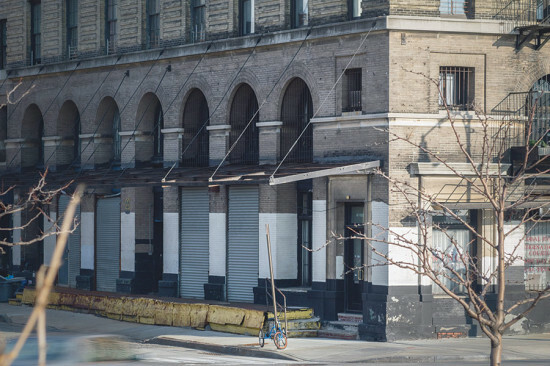 The building is not just architecturally distinct, they said, it was a cornerstone in Tribeca's rapidly disappearing arts scene. 67 Vestry once housed artists including John Chamberlain, Marisol, and Andy Warhol. As BuzzBuzz noted, though, there appear to only be interior demolition permits filed, so there is a chance the exterior could be saved. SLCE is serving as the architect of record for this project. Never mind! After all that fuss to preserve the iconic Texas tin structure, Rice University's Art Barn met the Grim Reaper on Wednesday, April 16. While a group was able to salvage the building’s corrugated metal siding, wrecking crews tore away at the Martel Center's structure, marking a definitive end to efforts of preservationists to move the building to another site in Houston. Andy Warhol’s famous oak tree planted in front of the former structure will remain intact, but once the dust clears only a grass lawn will serve as tombstone. A rogue power line temporarily stalled the demolition, thereby buying a commemorative moment for the Art Barn’s historical and cultural import. 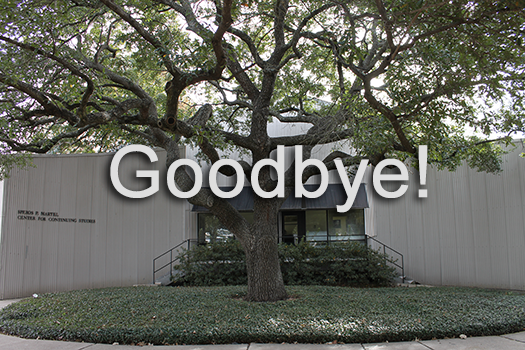 The building’s spirit will live on through the Menil Collection it once housed, as well as its legacy with other tin houses. For some, a portrait of Queen Elizabeth hearkens to days of "Long live the Queen!" but a recent design intervention could edit that phrase to "Long live Warhol!" Brooklyn-based Flavor Paper recently launched a collection of proprietary designs from the Andy Warhol Foundation for the Visual Arts' store of works in PVC-free, water-based ink formats that can be customized for a variety of applications. Warhol produced eight of his own designs for wallpaper between 1966 and 1986—including the notable "Cows"—so the Foundation was especially selective when licensing reproductions in one of the artist's own mediums. "We walked through Flavor Paper's door, and knew that we had found the right fit," said Michael Hermann, The Andy Warhol Foundation for the ArtsDirector of Licensing. "We always saw licensing wallpaper as a compelling and complementary category, but until Flavor Paper had not found a collaborator who understood how to break through the constraints of such a traditional method." For Flavor Paper's founder and creative director, Jon Sherman, the creative light bulb went off in 2011, when the company worked with the Montclair Art Museum to finalize designs and produce the "Twelve Cars" wallpaper series for the exhibition Warhol and Cars: American Icons. "As a true Warhol enthusiast, this opportunity for me personally is like a fantasy fulfilled," Sherman said of the new collection. "Working with the Foundation's team to celebrate and interpret Warhol's work in our own inimitable style is a milestone for the brand." 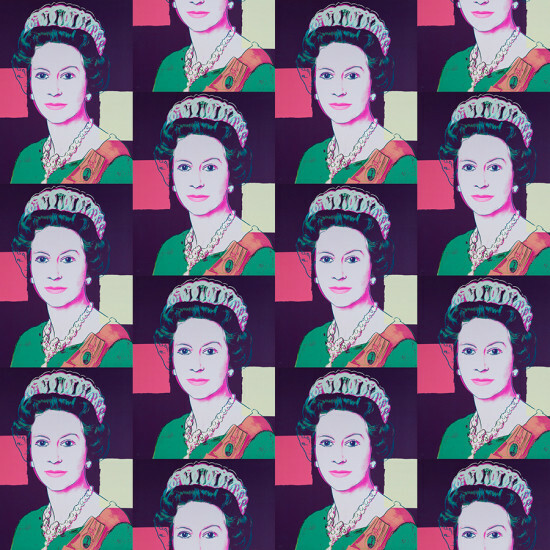 Nine styles were produced from a cache of Warhol's silkscreen prints, photographs, and other iconic images. Flavor Paper uses water-based inks produced for billboard applications, so each sheet of paper is durable and light fast. This mural option, also available in Sailboat, is based on Warhol's 1962 paint-by-number series. Each mural is scaled to fit application dimensions. A recurring pattern was developed from a 1955 Newswire photograph of St. Peter's Square in Rome on Easter Sunday. Flavor Paper's Sherman inserted an image of Warhol, for a tongue-in-cheek "Where's Waldo?" effect. The pattern comes in four standard colorways with the option for customization. Based on Warhol's 1964 silkscreen of hibiscus blooms, a repeating pattern is digitally rendered in four colorways on a chrome mylar base. In a nod to Warhol's very personal practice of embellishing his oxidation paintings, random splashes of toner make each pattern truly unique. Flavor Paper organizes Warhol's Inkblot paintings for unique adaptions on a damask pattern. Four color combinations on high-gloss or textured papers, like ponyskin and linen, add to the pattern's luxe appearance. Layered and repeating photos of Halston-designed shoes from the 1980s are available in four colors, with options for customization. Drella, (pictured), features a glitter impregnated vinyl that closely resembles Warhol's own Diamond Dust treatment.